Guatemalan rum producer Casa Botran has teamed up with branding, marketing and design agency Appartement 103 to develop its 75th Anniversary special edition, Botran & Co. The aged rum was produced using the company’s solera process whereby the rum matures in ex-Bourbon white oak casks, toasted casks, ex-Sherry, ex-Port, and ex-South American wine casks. Apparement 103’s brief was to reflect this in the pack design. 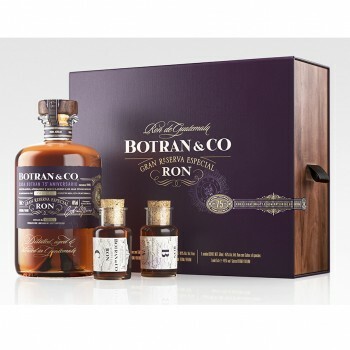 An outer wooden box contains a 50cl rum from the Botrán family’s private reserve, aged for up to 30 years. The bottle is presented alongside two miniature 5cl bottles which contain “spiced” rum and “citrus” rum. Consumers can then opt to “explore different tastes” by mixing the three together. The pack contains a pipette and leaflet which explains the blending process. On-pack printing techniques include hot foil detailing, embossing, varnish, textures and screening, combining for a “tactile experience”. Marc Savary, Appartement 103’s creative director, added:“The carefully designed embossed stamp on the label, the organic selected paper, as well as the hand drawing screened typeface on the glass, reinforce the long history of the [Botran] company, ensuring the heritage and quality perception of the brand. Botran & Co was officially launched on 30 September during Casa Botran’s 75th Anniversary party at the Casino de Madrid. The product is limited to 9,972 bottles.